When I asked the question “do you ebelskiver?” on The Facebook last week, I wasn’t prepared for the excited response I received. Many of you actually knew what ebelskivers are (we must be soulmates, you and I). Others didn’t know but were interested in learning more which I love you for. Trust me. You want to know more about ebelskivers. Years ago, my awesome and crazy Uncle Dan made them for my family when we visited them on one of our yearly cross-country treks from Texas to Idaho. I think I was only nine or thereabouts but I remember thinking my Uncle Dan and Aunt Marilyn had to be the coolest people in the universe to know how to make pancakes that were puffy spheres. To a 9-year old girl with a wild imagination, that was, like, a very stellar super power. They have become a staple in our house ever since (both the house I grew up in and now with my own little family). Although many people reserve them for special brunches or Christmas morning type deals, we eat them quite often on Sunday afternoons when this momma doesn’t want to mess with the whole big Sunday meal. Jackson, my 9-year old (must be the age), has taken an avid interest in ebelskivering (yep, it’s a thing) and has become quite proficient at turning them in the pan which leaves me to other important tasks like cleaning out the inside of the nutella jar. 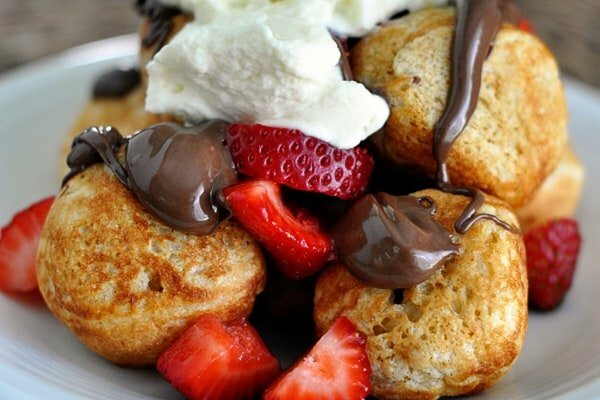 Ebelskivers are a Danish pancake that cook up in a special pan to form a delightfully fluffy ball of breakfast love that can be stuffed with any variety of things (bits of sweetened cream cheese, fruit, nutella or other chocolatey decadence) or just cooked up and drizzled with syrup, dusted with powdered sugar or served with fresh fruit and whipped cream. Surely you see how the possibilities are endless. You can go all out or keep it ultra-simple. You’ll see from the step-by-step pictures below how the batter goes from a runny puddle to a puffy puff. We use a knitting needle to turn the sweet things (appropriate since I’ve tried and failed to learn how to knit, oh, at least 13 times; this is a far better use for the needles than throwing them across the room in frustration) or metal chopsticks my brother brought back from Korea for me when he was there years ago. You can see how good I am at repurposing skinny metal items, no? Chances are if you’ve known our family long enough, you’ve eaten ebelskivers at our house. Nothing solidifies friendship like ebelskivering together. In a large bowl, whisk together the eggs and sugar. Mix in the buttermilk, vanilla and oil. Stir in the flour, baking soda, baking powder and salt until just combined. Pour 3-4 tablespoons oil in a small cup and keep near the stove. You'll need a pastry brush or paper towel to rub oil into the pan between batches. Preheat an ebelskiver pan over medium heat for 4-5 minutes until hot (the batter should sizzle when poured into the pan - but take care it isn't so hot to burn the ebelskivers). Brush each cup with a tiny bit of oil. Pour enough batter into each cup to fill about 3/4 of the way. If you are planning on adding a filling (like fruit/jam, etc.) don't fill quite as full. Let the ebelskivers cook for a minute or so until tiny bubbles begin to show on the surface and the edges look like they are setting a bit. Add any filling to the center of the batter at this point and top with a tiny bit of batter to cover. Using a knitting needle or other similar long, thin tool, push the tip into the middle of the batter to the bottom of the cup and gently lift the ebelskiver so that it turns and the cooked part is lifted out of the pan. The uncooked batter will run into the bottom of the cup. Let the ebelskiver cook a bit more (it will depend on how hot your pan is - don't let them burn!) and turn again, slightly twisting so the seam from the first turn lifts out of the cup, with the needle so that it begins to form a ball shape (see the step-by-step pictures below). If the cooking process seems confusing, just simply keep turning the ebelskiver so it doesn't burn and so that it cooks evenly on each side. Again, let it cook for a minute and then turn again so the opening is now on the bottom of the hot pan to cook all the way through. I like to toss the cooked ebelskivers in a 9X13 pan and keep them in a warm oven (about 175 degrees or so) until they are all cooked. 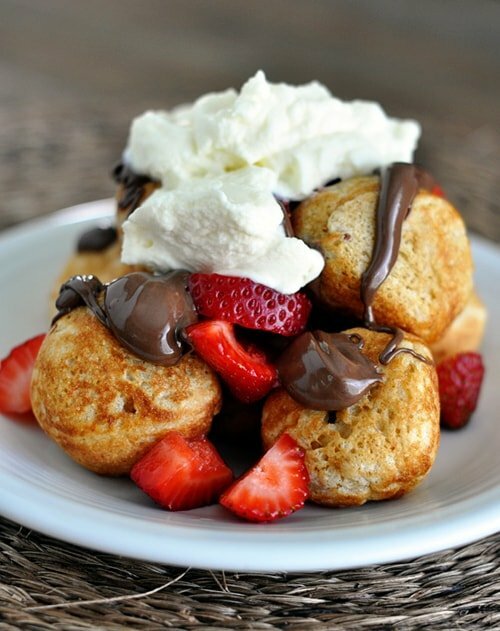 Serve warm with any variety of toppings: syrup, fruit and whipped cream, nutella, powdered sugar, jam. The options are endless! I always use at least 1/2 white wheat flour (sometimes more like 3/4) instead of all white flour and they are still absolutely delicious. It's super duper important if using a cast iron ebelskiver pan (like in my pictures) that it is well-seasoned. You can google how to season a cast iron pan - but proper seasoning will make all the difference in the world so that the ebelskivers don't stick. Recipe Source: ebelskiver recipe from my Aunt Marilyn; she and my Uncle Dan introduced my parents to ebelskivers years and years ago! I use a fondue fork to turn ours. It’s tiny,but having two prongs makes it a little easier to not slip. It’s such a great food associated with such happy memories! My Mom would make them for us. When I got married and made them for my husband the first time he ate twenty! We love them! Which end of the knitting needle is used: the hook end or the other side? I use the pointed end. I have made ableskivers for years for my family but the end of December I have been asked to make enough for 60 people. Can you help me with the amounts of ingredients, I will need? I am only going to sprinkle with powdered sugar. How many should I make for each adult? I would appreciate any suggestions you may have. Hi Judy – is that the only thing that you will be serving or will there be other dishes? If they are being served with other foods, I’d say probably 4-5 per person? That’s just a guess. So much depends on if there is a mix of adults/kids, etc. I was taught by my danish grandmother to use six eggs, beat egg whites then fold into the batter for the most amazing treat ever. I saw someone make these on a camping trip. Any idea how far in advance you can make the batter? I’m excited to try your recipe. I think you could probably make the batter a few days in advance. I found a Nordicware Ebelskiver pan at Goodwill today. Your recipe and directions really helped me feel confident giving these a try! They came out so cute! I can’t stop smiling at how easy and fast they are to make. I love this recipe too! It’s light and not too sweet. Thank you. I use many recipes from your blog. Anytime I want to make something, I check here first. I’m feeling like a rock star tonight! Made these for Christmas- they were a hit! My husband has Danish ancestors and we attempted to make some traditional foods from our heritage as a fun, different menu on Christmas. These ebelskivers were requested for a birthday breakfast. Thank you for a delicious and fun recipe! This is something the Harrison side of my family does for special occasions although, we tend to put most of toppings such as fruit or chocolate inside of ebelskivers and sauces or powdered sugar for the outsides. just back from Camden market and a chap was making Dutch pancakes just like these and it reminded me that I’d read up on these in Denmark once but my husband coming from Denmark has not passed on this lovely tradition to me and his daughter who LOVE pancakes and sweet things!! so just ordered a pan and printed out your recipe….can’t wait for my pan to arrive! I come from a German family with a Danish Branch and aebelskivers were a delicacy we enjoyed at least once a month. Like Mel’s son I enjoyed turning the ‘skivers and consuming them hot usually with preserves cherry or strawberry. I found a skillet (Nordic Wear) in a thrift store today and looked up a recipe and found your post. My mom (now well into her eighties) suggested substituting the buttermilk with dried buttermilk unless I have another use for the remaining buttermilk. That plus Nutella are in my next market basket! Thanks always a crowd fave for a hearty breakfast! Excellent recipe, and great instructions, thanks! A note on the yield, however: I use a Williams-Sonoma ebelskiver pan, and consistently get ~7 batches from this recipe. Thus, I get about 50 ebelskivers total…twice the “2 dozen, more or less” described in the recipe. That’s fine, though–they freeze really well, and make for great, easy breakfasts on busy mornings. Also, FWIW, the Williams-Sonoma ebelskiver pan works fine on our gas range. I use the same heat setting (slightly lower than medium) that I use when I make scrambled eggs in an All-Clad nonstick pan. I am Danish and grew up in Denmark having two grandmothers who both made delicious æbleskiver – I totally love you are using a knitting needle as the “turning” tool, this is by far the most used tool at least in my family – I even have one for the purpose alone ( I don’t knit), we will usually add a bit of cardamom and serve with powdered sugar and a bit of jam! Made these last night for dinner and they were fun. Your batter recipe is so much easier than others I found online! Only thing I will do differently next time is to do all white flour. I did half and half wheat and although they were heartier and healthier I just don’t care for the taste of wheat fried in oil. Also, I struggled with the flipping technique so some of mine didn’t turn out too pretty but I will follow the handy guide next time! Also going to add apple chunks next time and they will be just like the ones my mom used to make. There is something heartwarming about cooking with an ebelskiver pan passed down through generations. Thank you for the recipe!!! Amazon has a selection of gas burner diffusers on their website. Mine is perfectly flat, but others have a different surface. Hi! I made ebelskivers for the first time yesterday in a Nordic Ware ebelskiver pan. Mine were flat, but then I had not yet seen your website. We have a gas stovetop, so I use a metal disk purchased years ago from King Arthur Flour to disperse the heat. It works pretty well, although some of the pancakes got done faster than others. Looking forward to trying your method of turning! Hi Beck: I have a gas cooktop and am using a Lodge cast iron aebelskiver pan. As with most other breakfast items (pancakes, scrambled eggs, boiling water for tea…), I find that the medium setting works to get the pan/kettle hot, but you have to watch it. As soon as a little bit of butter or oil starts to sizzle, I turn the stove to low or a little higher than low. This is how I made successful ‘skivers without burning them. With gas, you really have to watch the pan to ensure it’s not getting too hot, but you can make the aebelskivers with a cast iron pot on a gas stove. And it’s worth it! Bummer. I just purchased a cast iron ebleskiver pan, but I have a gas stove top… So, it won’t work? I use cast iron all the time, so I just assumed it would work. Now what do I do? I am really hoping to make these soon! Beck – it’s worth a try. I’ve never used on on a gas cooktop so you might want to look around online to see if anyone has experience with that. We have gas cook top. the pan works great. keep It on low and turn the cakes often. Yum! First, thank you for the delightful and informative blog! I received a long-desired ebelskiver cast iron pan for my B-Day recently and appreciated finding staightforward instructions for its inaugural use (to the tune of Young Frankenstein’s It’s Alive! and in the spirit of the season, I sing “I’m inspired! I’m inspired!”). For my novice use, I found a combination of a bamboo skewer and a flimsy plastic handled paring knife with a thin flexible blade (for helping to separate the edge of the e’cakes from the sides of the pre-seasoned pan’s cups) to be very helpful. Yes, two-handed ebleskiver turning is probably heretical in certain quarters and it probably does prove that I am less skilled than your 5-year old, but I am a beginner here….Anyway, thanks for the guidance. Making the e’cakes was a whole lot of fun, after the first nerve-wracking batch, and generated appreciative comments, like “delicious!” from the recipients. One thing I’ll note is that your recipe makes a ton of ‘skivers. The two of us have enough left over for three days of breakfast to come. We can each eat a panful (6-7) before feeling terminal. Be still my heart, Mel! I have been making/eating ebelskivvers my whole life, which makes me think we are truly food-sisters, or, at the very least, distant cousins. Bless you for introducing Nutella into my ebelskivver heaven. A master stroke! We traditionally make these little balls of goodness the first Sundays of April and October, so I’ll be trying the new combo tomorrow morning. We had these for breakfast this morning & they were yummy! Thanks for reminding me to use my elbelskiver pan again…it’s been a couple years since I have! Yeah! I ordered me one of the pans you like and just got it today! We have having aebleskivers tomorrow! Yum! Thanks! I love me some aebleskivers! I make many different kinds . . . some sweet, some savory, some plain. My husband prefers the plain with just a tad bit of butter and real maple syrup. My daughter prefers the savory stuffed with bacon or ham. I like them topped with powdered sugar, strawberries, whipped cream . . . and syrup. I usually turn mine with the short (maybe three-inch?) wooden skewers; I use two (one in each hand), flip the aebleskiver a quarter to fill the cup, then turn it again. Perfectly round delightful balls of heaven! I grew up with these… my friends & I would have competitions to see who could eat the most. If you’re in the area of Calgary, Canada, the Danish Canadian Club makes them for their Saturday Brunch. @ Brinestone… If you have a gas stove, use a pan that has a flat closed bottom, this helps to spread the heat. My sister has a gas stove & I had to bring some flat bottomed pans back from Denmark with me, as all the ones we found here were open on the bottom. Top it off with butter and caramel. Right now my children love peanut butter, bacon & maple syrup combo so that is what we would too them with! Top with blueberries and honey. This would be nice to have to make a quick dessert or breakfast. Maple syrup and whipped cream would be a nice topping. Thank you. We are eblskevers too! I don’t know why we haven’t thought of nutella before!! Upon reading and looking at this post, I promptly bought the pan you recommended on Amazon. It came yesterday, and this morning we made ebelskivers. My first batch was a disaster – pan not oiled enough, heat too high – and they all turned to black sadness. I turned it down, washed the pan and tried again…and SUCCESS – majorly. These are great! So very fun, and my kids thought they were pretty awesome. We did strawberry jam, powdered sugar and syrup. Ryan stuffed a few of his with bananas and nutella. Holy cow. Great, great fun for a slow-paced morning! Thank you! I’ve never heard of these. Could you fill them with with the same filling as a cinnamon roll?? Of course you can and how yummy that will be. In my kitchen ebelskivers are in 2 categories.. main dish and dessert. Cinnamon roll filing would probably fall neatly into both. My mother-in-law made us some ebelskivers at Thanksgiving and they were so delicious! She filled them with strawberry jam, ricotta cheese and chocolate chips!! So fantastic! So forget about waiting for the second pan, I had to try your batter recipe this morning. Like a previous commenter, my recipe involved separating the eggs and whipping the whites. Mel your recipe is just as light and fluffy and 10x easier! They were delicious and is now my go to ebelskiver recipe. WOW !!!!!!!! Ebelskivers sound great. High on my must try. Thanks for sharing. But, I will definitely be making your batter from now on instead. It looks delicious and it’s way less fussy. 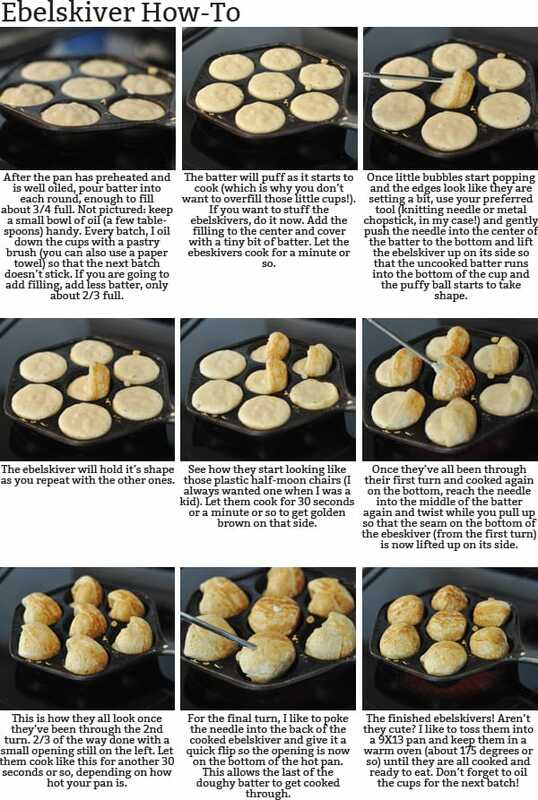 Lovely pictorial on turning the aebleskivers. Have always wondered how its done. We have already discussed our mutual love of ebelskivers, but I am so dense I never even entertained the thought of having two pans. Duh!! I definitely need another pan. We have a yummy recipe with a cinnamon filling that is my family’s favorite. I’ll be trying your batter recipe as soon as I get myself another pan! Hello from Green Bay!! My stepmother introduced me to the wonders of the Ebelskiver 30+ years ago. All childhood things come around again and I have been cooking them up for our young ones for about 10 years now. Our favorite topping is just a bit of butter, good maple syrup and powdered sugar. My recipe is similar to yours except I add a dash of Cardamom or Cinnamon for a bit of flavor. Additionally, I separate the egg whites, beat them stiff and fold them into the batter as my last step. Also, I use wood/bamboo skewers to turn them. The metal skewers retained too much heat after making a few dozen. I also grew up eating ebelskivers and now I’ve introduced my own children to them. I live about 30 minutes from the town of Solvang, CA which is an all things Danish village, so you can order ebelskivers at nearly every restaurant in town. You should come and visit! I love ebelskivers! They always remind me of my grandmother–she is half norwegian. a fellow ebelskiver soulmate of mine makes hers with a little ground cardamom and ohhhh are they yummy! Must try! We just got an Ebelskiver pan! My husband’s grandmother is Danish and his father remembers eating them as a child. It has been fun experimenting with them! We tried adding apple chunks or blueberries or ground sausage to them and decided we liked the apples best. I love how you added strawberries, whipped cream and chocolate! I’m excited to try your recipe! Thanks for your great recipes – we use them all the time! Oh my gosh. I agree! No one knows about these (well – mostly no one). We’ve been having ebleskeivers every Christmas morning for as long as I can remember. Love them! I was just checking comments my first comments doesn’t appear any reason why just asking? My son-in-law made these for us when he was dating my daughter they are heaven! I don’t know how much Japanese cooking you do, but these are like a sweet variety of takoyaki. If you have a Japanese specialty food store which sells small appliances as well, you may even be able to find a takoyaki maker. It’s an electric appliance that has about 10-20 spots to make them. If you google takoyaki maker you’ll see lot of pictures. Also, you can use wooden skewers, usually made from bamboo to turn your ebelskivers. It won’t scratch non-stick teflon pans either. Thanks for another interesting post…..hope you liked the zucchini bread. Okay, I am 1/4 Danish, how have I never heard of these? My Dear 100% Danish grandmother always made scones not Ebelskivers! I must skedaddle over to the giveaway to give these a shot. My family LOVES a good breakfast item. We do Breakfast for Dinner probably weekly around these parts. The strawberries, whipped cream and chocolate look yummy to me. Also would try our maple syrup we make every spring!! Yum~I hope I win a pan so I can try them! I have been meaning to attempt these. A friend introduced me to them with caramel sauce. To. Die. For. My SIL introduced these to me. So delicious. She put a bit of lemon zest in the batter and it was super tasty. It really brightens them up. I gotta win one of those pans so I can make my own with the whole wheat flour. She added a lot of oil in each spot, so lightning that up would be good too. I once had these a bizillion years ago at my college roommates house. We had them with applesauce and they were delicious! I would love to try them with strawberries, too. Oh lordy! Looks like I have to start making pancakes like this… These are irresistible, Mel! What a mouthwatering morning treat! It will make a perfect breakfast. I love pancakes but Ebelskivers are new for me. Do I need this pan to do them? Marta – yep, you need an ebelskiver pan but the good news is I’m giving away 10 on the giveaway pans linked above. I have been dying to try these pans for just ages. I have saved lots of recipes in hopes of getting one some day. These are so adorable! I bet my little guy would love them. I returned from a week-long trip to Denmark a few weeks ago. I have Danish ancestors and had a wonderful time seeing where they came from. Beautiful country. But I did not taste these while there … and now I demand to go back!! Anyone want to come along??!! 🙂 Guess I better get a pan and learn to make these at home while I’m waiting! These are a tradition in our family too and, just for extra excuses to make and eat them, they have turned into a rainy day treat. If it’s raining, we pull out the ebelskiver pan. We usually break them apart and dip them in melted butter and then directly into powdered sugar. Heavenly. I’m totally pulling out the Nutella next time! Thanks Mel! These look delicious like all of your recipes that I use daily. I need one of these pans! These look awesome! Would LOVE one of these pans. Probably not a splurge I’d buy myself, so pick me! Our favorite way to eat these delicious jewels are with sweetened cream cheese AND syrup. I can’t wait to try your recipe! We love ebelskivers!! 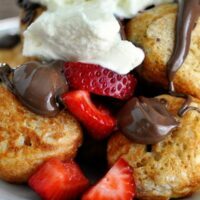 Sadly, I usually just use Bisquick and prepare the batter as I do for pancakes..but they are super delicious anyways!! I usually fill with Nutella or strawberry jam and top with melted butter and powdered sugar. Is it just me, or does a batch of pancake batter make like, infinity ebelskivers? We always have leftovers!! I would LOVE one! I would do blueberries and a yummy powdered sugar and orange glaze YUM! Strawberries and whip cream sound delish! Thank you so much for this recipe. My grandmother came over from Denmark when she was just 16, and she used to make these for us when I was young. Don’t have her pan or recipe so this brings back SUCH amazing memories. Thanks for sharing! Funny story about ebelskiver pans: my sister was recently at an antique shop and found that they had several pans. However, they weren’t labeled as ebelskiver pans. They were labeled as cornbread pans. My sister knew better and snatched one up because they were pretty cheap, even for being cast iron. Hi Jill – the pan I’m using (and have been using for almost 20 years) is an ebelskiver pan not a muffin pan. I addressed the different types of ebelskiver pans HERE and you are right, there are some ebelskiver pans that have more of a rounded cup. But I’ve found that it doesn’t matter the shape of the cup in the pan as long as you turn them while cooking (like the pictures in my how-to in the post). Some people cook ebelskivers by just flipping them once (like a pancake) and in that case, the rounded cups on the pans I use will produce a flatter ebelskiver. It just kind of depends on how you like to make them. 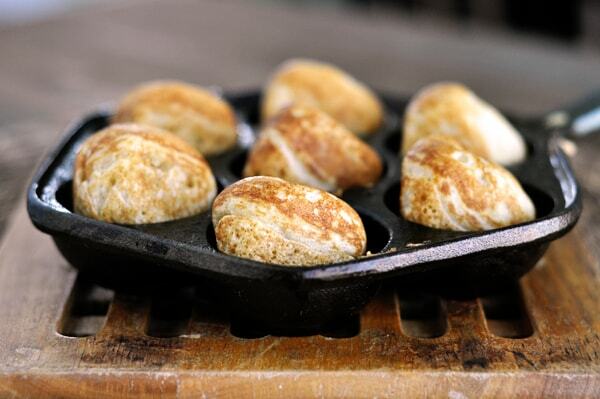 We make them by turning the batter throughout the cooking process and always end up with fluffy, round ebelskivers. Just wanted to clarify that the pan in my pictures really is an ebelskiver pan – not a flat muffin pan. Thanks for sharing your ebelskiver thoughts! We make these too, and love them! Only problem is that we have a glass cook top. Boo! You can’t use cast iron on them or they get ruined so we have to break out the camp stove and make them outside. They still taste great that way! Our family also gives them as wedding presents and we usually find inexpensive pans at antique stores. They are usually mislabled as egg poachers or something like that! I have the Williams Sonoma pan, and I have used it 4-5 times. Thank you for the step-by- step pictures, I have been missing a turn when I make them. I will try it your way, it makes more sense! I’m excited to try your recipe, thanks! Thank you so much Mel! My Dad served his mission in Denmark, so making ebelskivers is a family tradition! But i am embarrassed to say we always buy ebelskiver mix online, or buy a bunch when we go to Solvang! I am so excited to try your recipe for my family!! I just looked at the pictures, Mel. It looks like you are using a muffin pan with a flat bottom. True aebleskiver pans have perfectly round holes. I have both and it makes absolutely no difference in the taste, only the shape. Jill, I agree with you about separating, as it make the batter more fluffy and when the skibbers are baking/cooking they are round like golf balls. Ours are hollow so filling them is easy. I have never seen them with like this pictures. Hollow is better, easier to fill and more fun too. Just a warning for those seeking aebleskiver pans. Cast iron muffin pans look similar but the holes are not as deep. 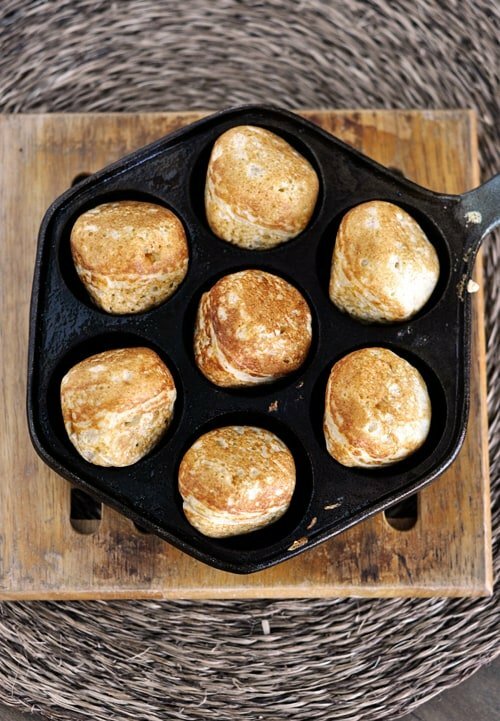 Get a true aebleskiver pan–its holes are perfect semi spheres–and your aebleskivers will be perfect fluffy balls. Another secret to fluffy balls is to separate the eggs. Add the yolks in the first step and beat the whites in another bowl. Fold them in after all other ingredients are mixed. Don’t mix them in too much, there sould still be a few fluffy tufts of beaten egg white. Our favorite way to serve them is to fill them with a bit of chopped apple pie filling and roll them in butter and then in powdered sugar or cinnamon and sugar. I came to your site for breakfast inspiration and I found it. This is my favorite breakfast. Yum! Thanks! These look absolutely delicious! I am a bit of a nutella addict do I could definitely see that being the first filling I would try!! Yum! My father-in-law went to Denmark on his mission and he always talks about these, but we have never had them. Awesome! Now I see what he was talking about. Yum! I married into an aebelskivering family, and now it’s a tradition every Christmas morning, plus whenever I feel like making them. I’m currently in a house with a gas stove, and it’s TERRIBLE for cooking these. The center slot burns, and the outer ones don’t cook. I’ve managed to make them anyway, because really, I have to for Christmas, by leaving the center one empty except for some water and rotating the outer ones around once they’re cooked but not brown. Anyway, we serve ours with apple butter and powdered sugar, and always bacon and pineapple/orange/banana juice. What temperature should the aebelskivers be baked and for how long? Clearly we have never eaten theses the right way…. who knew we were missing out. Those toppings look delicious. Mel, you are precious! 🙂 Love this blog! Laughing my way to work . . .
Why do these look so amazing? 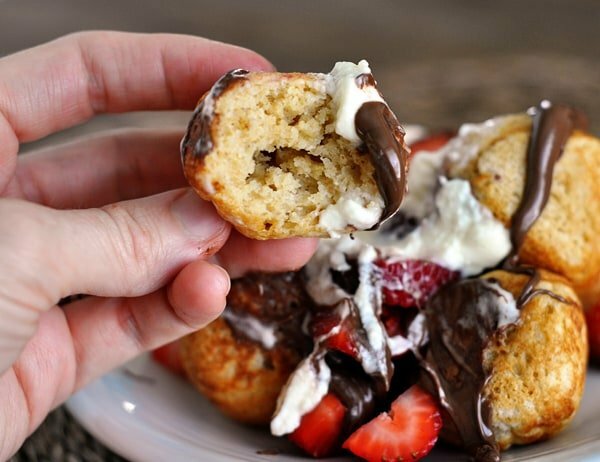 Now, I may just might have to go out and by myself a pan just so I can make these! This looks soooo lovely!! I love the cute little pan! I received an ebelskiver pan (from Williams Sonoma) as a gift years ago, along with a can of ebelskiver mix. I am embarrassed to say thati have never used the pan, and forgot I even had it until I saw this post! These look so delicious. Are they sort of like pancakes? I need to break out that pan and try this recipe. yes they are like pancake balls but light and fluffy still.